The Marsh Deer was first reported by Illiger in 1815. It inhabits Argentina, Bolivia, Brazil and Paraguay. This particular species is currently (2003) listed as vulnerable. Their population is in decline due to hunting, they are a prize game animal amongst hunters. Habitat destruction play another important factor in their decline. They weigh anywhere between 89 up to 125 kilograms. They are primarily a reddish-brown or chestnut colour, and the undersides and neck is lighter. Their lower legs are black. 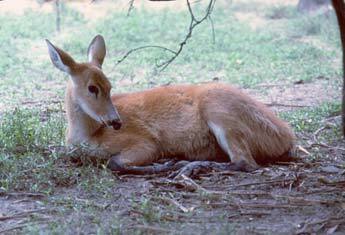 It is the largest of all South American deer, distinguishable by its multitined antlers of 8 to 10 points. They stand around 1 to 1.2 metres tall, and are around 1.9 metres in length. They have white rings around their eyes and ears. They also have a black band around their muzzle. They feed mainly on plant matter, and as they inhabit marshy conditions they will also feed on aquatic plant matter such as water lilys. They will roam about solitarily, or in small groups of up to five individuals. They prefer to live in marshland areas (hence the name), particularly water with dense vegetation.